As it looks now, I will be leading another workshop with my friend Jim Zuckerman to the bottom of France, near Arles, where Van Gogh painted many of his masterpieces. We will be photographing these gorgeous one of a kind all white horses which have been around for over 5,000 years, with Napoleon riding them in many famous paintings of him. There will be all kinds of shooting including in the marshes, running in the surf of the ocean, through the dirt and dust, stallions bucking, in the grassy fields with slow shutter speeds… close ups and much more. Maybe even a baby with it’s mother. 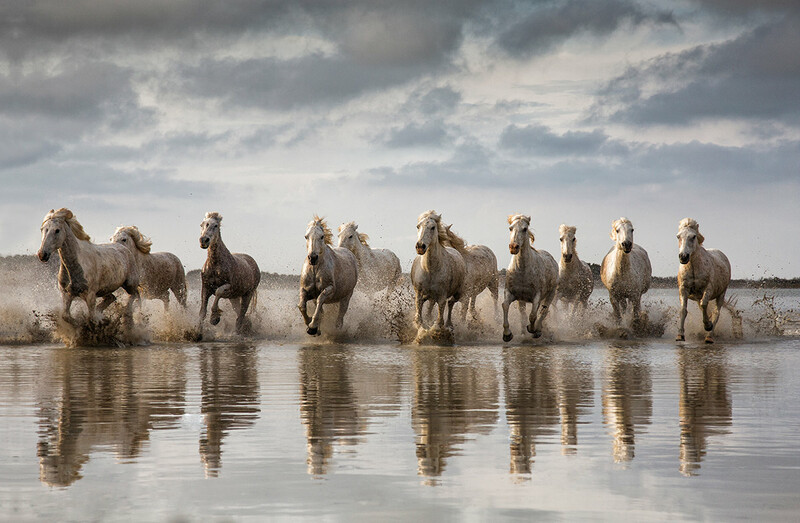 This has always been one of my favorite places on earth to shoot and the Camargue horses are just poetry in motion. This one of a kind workshop will be around $3,950 and approximately $825 for a single room supplement if you want to have your own room. We are working on the cotsts right now and will know more very soon. The workshop includes nine shooting sessions over 5 days, your hotel room near the horses, breakfasts possibly, and picking you up at the Marseilles airport. If you are interested, please let me know as this is one amazing animal to capture. Photographing these beautiful horses is a once in a lifetime experience and you will learn how to photograph them in many different ways and you will leave with some of your best photographs ever!!! We will also be photographing in a nearby bird sanctuary where there will many kinds of migratory birds including herons, egrets and thousands of flamingos that fly and feed right next to you. You can look at my Camargue Horse workshop 2014 categoryon my website which has many images of the Camargue horses from my previous workshop there. Please email me here for more info and to answer any questions. Please click on this link to read more about the last Camargue workshop on my blog, which also has more photos of the horses and terrain. I AM SCHEDULING MORE WORKSHOPS FOR 2016 POSSIBLY TO THE COAST OF MAINE, NAMIBIA, THE PALOUSE, INDIA AND A FEW MORE PLACES AND HOPING THESE WILL BE UP ON MY SITE SOON....BUT PLEASE EMAIL ME IF YOU ARE INTERESTED AND HAVE ANY QUESTIONS FOR 2016 WORKSHOPS.